Home » Would you like to get your evening back? Many parents tell us that they find providing meals stressful, in particular the evening meal. They go to the effort of getting a meal on the table and then one or more of the family members could well reject it. So they resort to catering to the likes and dislikes of individual family members and end up preparing at least two separate meals, if not more. They start food preparation in the afternoon and finish much later in the evening after feeding their children and then later, their partner. In short, they are dealing with food, cooking, feeding and cleaning up for several hours of the evening. Family meals are pleasant. Resist talking about the food; rather talk about anything but the food. Your child is hungry by the time the meal is served. Parents often serve dinner too close to afternoon tea. Children need to be hungry in order to want to eat. Serve dinner 2½ to 3 hours after afternoon tea, so that they have had a chance to get hungry. You let them decide what to eat from what you have offered. Coaxing, bribing or distracting your child usually has the opposite effect to what you want. They are likely to fall for it in the beginning but not for long! You include at least one familiar food that you know your child will eat if they are hungry. This is typically bread of any sort, plain pasta, or plain rice. When you do this, you can feel confident that your child is not leaving the table hungry. You turn off the TV, DVD, cell phone, or iPad. Sure, they might eat a bit in front of the screen, but it is a good idea that they are aware of what they are eating rather than eating food while distracted. You serve whatever it is that you want to eat. 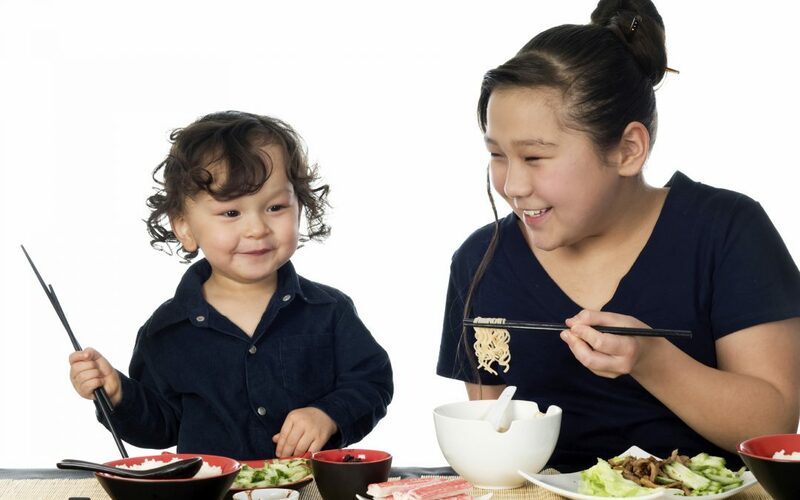 Children adapt to their family’s food rather than you having to adapt to what you think they might eat. This takes time, sometimes a long time, however it will happen sooner if there is no pressure to eat any particular foods or amount of food. Such sound advice for making meal times pleasant and memorable for the whole family.